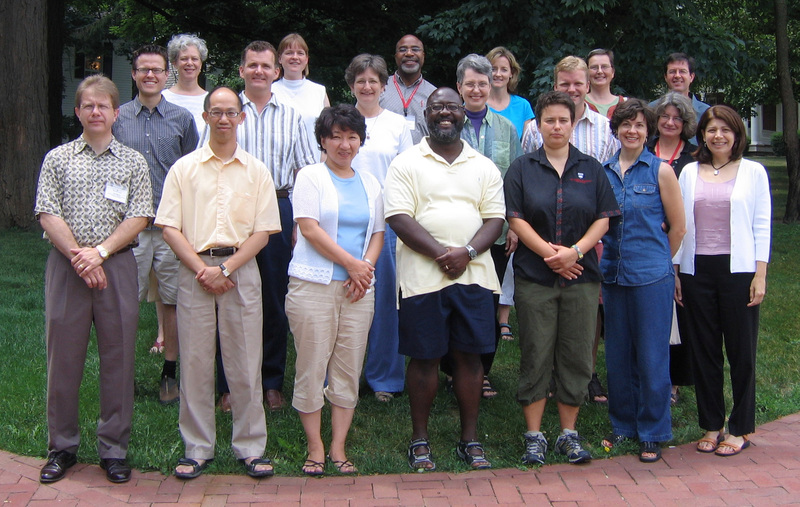 Front Row (left to right): *Paul Myhre (Wabash Center), Alan Lai (Vancouver School of Theology), Boyung Lee (Pacific School of Religion), *Willie James Jennings (Duke Divinity School), Marion Grau (Church Divinity School of the Pacific), Jennifer Lord (Lancaster Theological Seminary), Mary Moschella (Wesley Theological Seminary). Second Row: Robert Alvis (St. Meinrad School of Theology), Michael Koppel (Wesley Theological Seminary), Jeanne Hoeft (St. Paul School of Theology), *Mary Elizabeth Moore (Candler School of Theology), Jeffrey Hensley, Sr. (Virginia Theological Seminary), Susan Eastman (Duke Divinity School). Third Row: *Nadine Pence Frantz (Bethany Theological Seminary), Lisa Hess (United Theological Seminary, Dayton), Jeffrey Tribble Sr. (Garrett-Evangelical Theological Seminary), Shelly Rambo (Boston University School of Theology), Louise Graves (University of Winnipeg: Faculty of Theology), *Richard Ascough (Queen’s Theological College). This project concerns the development of “Global Christianity,” a new course devoted to understanding the history and character of Christianity as it has developed outside of Europe and the United States. The course is intended to provide students an opportunity to explore the distinctive features and challenges of Christian life in Asia, Africa, and Latin America, regions that receive very little attention across the curriculum at the St. Meinrad School of Theology. In undertaking such an exploration, students will be challenged to broaden their understanding of the faith and the diverse ways it has been enacted across cultures. The need for such a course is underscored by the growing international student population at St. Meinrad in particular and the impressive growth of Christianity in Asia, Africa, and Latin America as a whole. In her years as both a pastor and an educator, Dr. Eastman became acutely aware of a gap that occurs between seminary courses on the Bible and biblical education in churches. With the goal of helping future pastors bridge that gap, she teaches an exit course at Duke Divinity School entitled “Bible Study Programs for the Local Church.” Students become familiar with existing Bible study curricula, develop criteria for evaluating them in regard to content, pedagogy, and suitability for different ministry settings, and develop their own studies, as groups and as individuals. The course is thus practice in pedagogical methods as well as biblical education. As such, it is ideal for further development through participation in a Wabash workshop. This teaching project aims to increase the effectiveness of this course. She will teach the course in the spring of 2006 and implement new techniques. In particular, she is developing ways to involve students more effectively in evaluating their own learning and teaching styles. In addition, her goal is to develop ways to teach and model pedagogies of the New Testament while communicating its content. In this pedagogical project Dr. Graves seeks to explore how to integrate spiritual practice as part of educational pedagogy in a way that supports, encourages, and complements intellectual inquiry within a particular theological or pastoral discipline. She brings to this work certain assumptions about the nature of intellectual inquiry and contemplative practice. These are that intellectual inquiry tends to be analytical in nature and as such, tends to break down the whole into parts, focusing on the particular. Contemplative practice, on the other hand, tends to integral in nature, leading one to see the whole in terms of inter-relatedness. Intellectualization tends to objectification, contemplation energizes communion. The challenge for this project is one of seeking to understand how contemplation can help students take what is reduced intellectually and see themselves integrally connected with that which they hold and interpret. This project examines the use of the visual arts in teaching Christology. It specifically investigates the history of visual presentations of Christ, primarily in the west, from the earliest images of Christ in Roman catacombs; the Crucifix traditions of the 10th and 11th centuries; the Isenheim Alterpiece of Grünewald; 17th century Dutch and Flemish painting; Casper David Friedrich and the Romantic movement; to the painting of Stanley Spencer, Marc Chagall, Salvador Dali, and Roger Wagner in the 20th century. More generally, it explores the theological issues at stake in the use of visual art and material representation in theology (e.g., through a deeper understanding of the iconoclast controversies of the 7th-9th centuries). The major underlying pedagogical issue of this project is to develop ways of integrating the visual arts into the course in such a way that they are honored as theologically enacted ‘texts’ and not merely as illustrations, decorations, or window dressing to a fundamentally verbal discipline. This involves a re-orientation of the notion of a theological text and of theology as a discipline, as an embodied act of seeing and hearing as well as conceptualizing. This project marks the primarily conceptual reformulation of the United Seminary (OH) ministry formation curriculum, previously called “pastoral supervision” in Transforming the Rough Places (Ken Pohly, Providence House, 2001). This reformulated, practical theological pedagogy is constituted by facilitated peer-group teaching/learning and is based in communal spiritual practice within a liturgical and theological framework for critical theological reflection. Reliant upon two preliminary disciplines of vulnerability in an opening liturgical frame—Sabbath-practice and shared song—students covenant in groups to share their spiritual autobiographies, contextual learning in case studies, and integrative theological statements for ministry. This interpersonal, theological curriculum encourages (mostly North American) students’ explorations of vulnerability to God and to one another through shared spiritual practice toward an authentically humanized mutuality in the power of the Spirit for the good of a hurting world. The goal of this project is to critically explore the effective use of autobiography/biography, film, and role-play for teaching and learning in the field of pastoral care. In order to accomplish this goal Dr. Hoeft plans to develop a bibliography on critical and methodological approaches to studying autobiography/biography, film and role-play; to identify specific sources in autobiography/biography and film that lend themselves to use in teaching parish based pastoral care and in her scholarship on violence and cultural construction; and to incorporate these sources and methods (as appropriate) into her current course syllabi. Designed primarily for M.Div. students preparing for the practice of ministry in congregations and other settings, this would be a new course in the curriculum. Content and structure of the course assumes introductory level knowledge of pastoral theology and care as well as biblical interpretation. The project has two components: (1) actual course development, and (2) the writing of an article which addresses teaching and learning issues regarding the practice of silence in ministry. The course itself would be co-taught with Denise Dombkowski Hopkins, Professor of Hebrew Bible at Wesley Theological Seminary. Collaboration is needed across academic disciplines in order to help students prepare for ministry. The course would be interdisciplinary, drawing from the resources of biblical and pastoral theological scholarship. Critical examination of biblical texts and pastoral practice will enable students to increase proficiency in their ability to articulate meaningful language and to engage in care-filled practices of the Christian tradition. Transformational learning theory is a school of thought in the field of adult education that highly values adults’ abilities for critical reflection and the consequential perspective change. Transformational learning theorist such as Jack Mezirow is interested in validating contested truth claims, which makes his theory cognitively focused. As an Asian religious educator, Dr. Lai asks these questions: What is transformational learning according to East Asian religious traditions? What would the Asian sages say about transformation? In what way is transformational learning religious? This project is about investigating the notion of transformation in East Asian religious thought, notably Confucianism, Taoism and Buddhism. The findings of this project will allow him to develop the spiritual dimensions of teaching and learning. Dr. Lee intends to develop teaching strategies for local church Bible studies based on postcolonial biblical hermeneutics. Postcolonial biblical scholars insist that Bible pedagogy must “decolonize” scripture since texts typically were written in ancient imperial settings and were subsequently interpreted by Western imperialists, thereby shaping the worldviews of both colonizers and the colonized. In her project, she will explore how to implement postcolonial hermeneutics in local faith communities so that Bible studies can become a vehicle for social transformation. Particularly and utilizing adult learning theories, she will explore teaching strategies thus to introduce postcolonial biblical hermeneutics to middle-class congregations, ones that typically do not have oppressed/colonized awareness. The result of the project will be a syllabus tentatively entitled “Teaching Justice, Teaching Justly: Postcolonial Bible Studies,” a course that she plans to offer for seminarians and local church ministers in the summer of 2006 at the Graduate Theological Union. In this project Dr. Lord explores the pedagogy of Differentiated Instruction as a means of attending to student diversity in the seminary classroom. Denominational differences are one example of this diversity, and often provide an entry point for identifying different learning needs of students and other facets of diversity. In this project she focuses on denominational diversity in an introductory preaching class, and how the design of the course will serve students from different preaching traditions. The pedagogy of Differentiated Instruction is one that attends to diverse student needs by asking how students learn, and how students can be offered a variety of ways to show what they have learned. This second aspect of this pedagogy raises interesting questions for a preaching class in which the classic sermon is still understood as a speech act by one person in the midst of many; does the discipline itself dictate a pedagogical method? The project involves a course entitled, “Ethnography and Transformation in Congregations and Communities.” While grounded in pastoral theology, the course includes materials from diverse fields, i.e., sociology, religious studies, and social psychology. Students study a congregation or community where they do ministry and focus on “reflexivity”—the impact that student researchers have on the research, and the impact that the research process has on them and on the congregation. The results are sometimes transformative—either for students, who gain new insight into how they are perceived in their ministries—or for the congregations they serve, who often feel “heard” in a new way, or for both. Primary aims for this project entail exploring pedagogical tools for interdisciplinary teaching and learning and analyzing course goals, materials, and teaching methods, in conversation with colleagues and staff. One primary goal concerns trying to clarify a trajectory of thought that grounds the interdisciplinary knowledges and practices into a pastoral theological framework. Given the complex religious landscape of our world and the violence precipitated by religious differences, I aim to design a theology course that introduces students to theological reflection in the midst of these complexities. At the heart of contemporary theological study, I claim, are questions about trauma, suffering, and global conflict. Revealing to students what’s at stake in theological inquiry will transform the ways that they engage with the classical and modern theologians that we will read throughout the semester. This project will allow me to rethink the ways that theology is taught at an introductory level, exposing both the limitations and possibilities of methodological approaches: systematic, doctrinal, philosophical, and constructive. This teaching project focuses on the professor’s development as a more critical and reflective theological educator in two new courses that were approved last year by his faculty and that he is teaching for the first time this year. The courses are “Pastoral Leadership in the African American Experience” (fall semester) and “Seminar in Practical Theology,” (spring semester) an upper level Masters/Ph.D. level course. Both courses will be moderated by him along with a senior colleague in Practical Theology. The first course, which explores theological, social science, and practical ministry resources to strengthen the praxis of ministry in the African American Experience, connects his research interests with his teaching as it is designed to use his new book as one of the central texts. The second course draws extensively upon the contributions of faculty colleagues in the Theory and Practice of Ministry and assists upper level graduate students in developing their research proposals in practical theology in their disciplines of Liturical studies, Pastoral Care, Congregational Studies and Christian Education, and Congregational Leadership.